The British Food Standards Agency just announced a new front-of-package voluntary labeling system to likely go onto food packages next year. 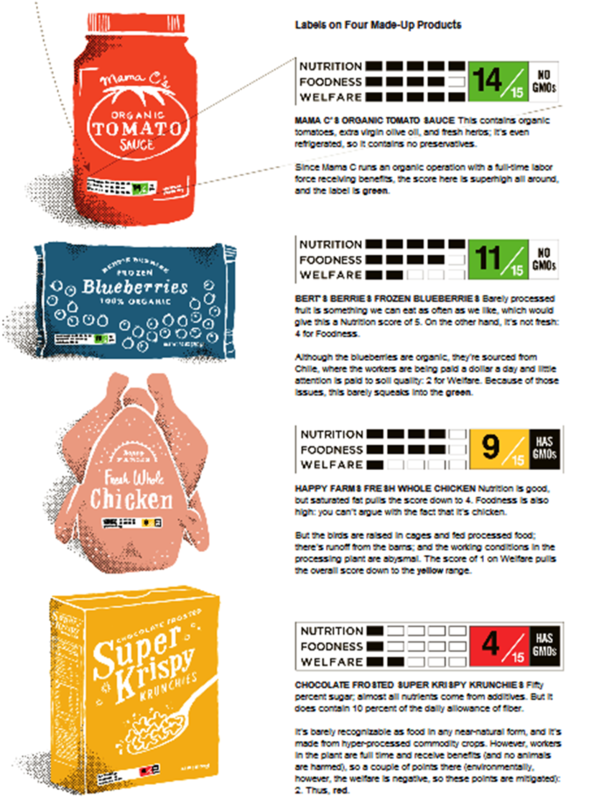 Compare this to the scheme Mark Bittman suggested in the The New York Times last week . Recall that the FDA recruited the Institute of Medicine to recommend a new labeling scheme. It did just that a year ago, in a report advising the FDA to restrict front-of-package labels to information about calories, saturated and trans fat, sugar, and salt. In the meantime, Whole Foods has implemented its own new traffic light labeling scheme, but without those pesky red symbols well established to discourage sales. If the food doesn't rate a green or yellow symbol, it won't have anything on it. Everybody is doing food rating systems. The owner of Rouge Tomate has developed SPE certification for restaurants, a system based on "Sourcing, Preparing, and Enhancing philosophy and culinary techniques." All of the people doing rating and certification systems set up their own criteria, and all differ. Are these systems helpful? Only if you trust that they are meaningful.